Chimayo is a small chapel 35 minutes outside of Santa Fe. It has been known as the Lourdes of the U.S.A. but instead of having healing water it has sacred soil. There are thousands of pilgrims each year that come seeking healing for body, heart, and mind. The landscape around the chapel had a freshwater stream. This water gave the Earth more fertility then what you usually find in New Mexico. We came into the chapel grounds to find an outdoor altar that was erected to say mass, next to this area was a small shrine. We went into the shrine and sat down. There was another altar and art-mural on the wall. It was dedicated to the Native American Ancestors, this was their healing grounds before the coming of the church. 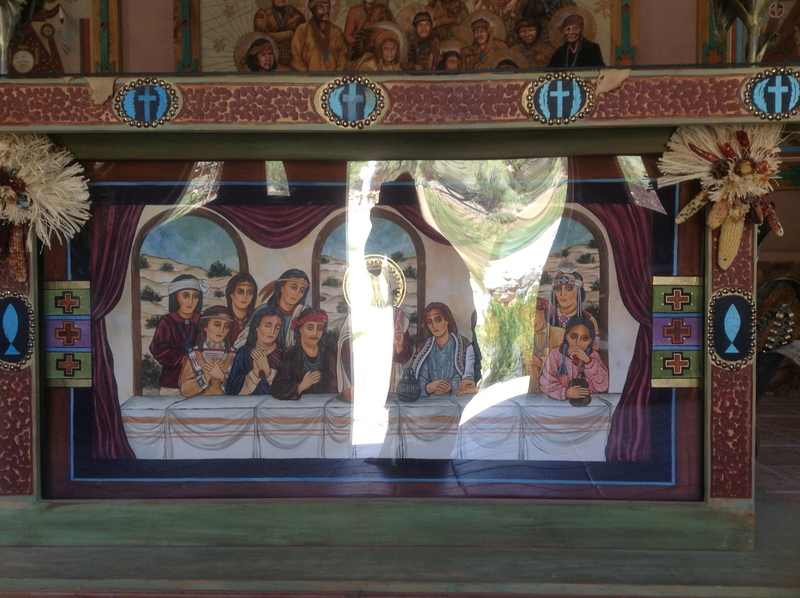 The artwork below the altar was of Christ breaking bread at a table with Native American Indians. This brings me to another Medicine Story I would like to share: It was the year 1989 and I came to Mt. Shasta to help with a video project that was being made to create awareness to protect Mt. Shasta as a Sacred Site. The real estate developers wanted to build on the land. We were camping on the mountain and I closed my eyes to go to sleep and all of a sudden I felt the earth shake beneath me…I woke up suddenly and said out loud “I am here to help”. The next morning I went to one of the many fresh water springs on the mountain. I notice that many people had come into the area to do ceremony. The ground was littered with sage sticks…..the wildflowers were trampled with no thought of where people were stepping. Spiritual graffiti was left behind. I was surprised and all so sadden to see such disrespect for the land. I sat down by the spring and went into meditation. The nature spirits in the form of little gnomes appeared in my mind’s eye….they were upset about the situation as much as I was. I began to breathe deeply and a sheet of White Light appeared, held by the gnomes. They lowered it into the Earth. Deeper and deeper into the Mother Earth my guides lowered the white light sheet. Then it began to rise back to the surface. I then saw the face of Christ! The image looked like the Shroud of Turin. Christ then spoke to me and said:”When I was crucified my blood spilled onto the Earth and in that moment she too became Christ-ed. This experience even though it happened many years ago taught me something very profound that I still hold true today. It was a vision of how Sacred this Earth is and how our unconsciousness separation from Nature has created all of us so much suffering. I find myself back in the small shrine at Chimayo. I looked at the artwork under glass of Christ at the table breaking bread with the Ancestors. The glass and the sunlight created a reflection. The image of Christ dissolved into pure radiant light. The image of the surrounding landscape glowed on Christ’s table. Chimayo is a place where both the Spirit of Christ and the Sacred Earth blended together and this is its teaching and the healing. We moved on to the main chapel of Chimayo. 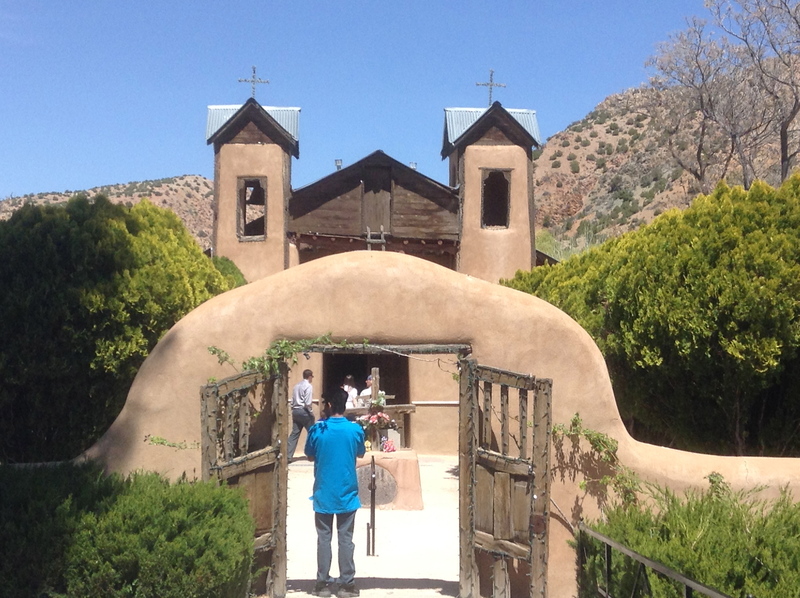 Easter was a few weeks before, a time when hundreds of people pilgrimage to Chimayo to find healing and to pray. We went into the chapel and the atmosphere was burden down with the suffering of the many people. The icon imagery was the bleeding Jesus, the bleeding heart of Mary and it felt like all the suffering of humanity. It was like walking through the layers of karmic conditions we all have to pass through as human beings. It was hard to even breathe in such a place. I tried to sit in the middle of it but it was difficult to go beyond the atmosphere and the icon artwork. The very air was heavy laden. 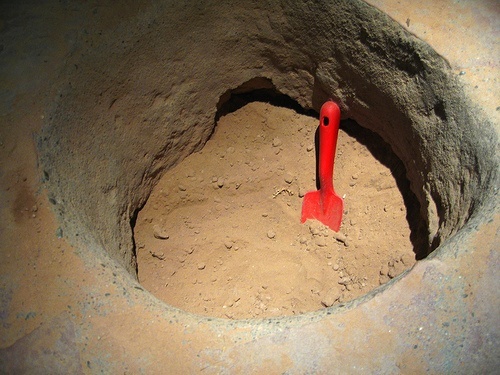 I got up and went through small doorway and entered a room with a hole in the ground….there was the holy dirt. I knelt beside the opening in the Earth and placed my hands into the soil. “This was why I was here!” It was cool, healing full of Life Giving Force. It felt like I was being feed through the umbilical cord of the Mother Earth. It was here everything was whole and healed. It is here where the connection to the Mother Earth and the Eternal Presence of the Christ Spirit came together for one’s liberation. I scooped up some soil and put it into a bag I had brought just for this purpose. Electrical energy moved through my body. The Kundalini within me and Mother Earth’s Kundalini joined together as I whispered my own prayers for healing in my own life’s process.